Order burgers, fries and sundaes from a McDonald’s restaurant near you. Get McDonald's delivered to your door! It’s the American franchise that has converted worldwide burger fans one Big Mac at time. Yep, you know the name, McDonald’s – or as us Aussies affectionately call it, Maccas. Underneath those famous Golden Arches lies a veritable treasure house filled with appetising aromas, guaranteed to make you hungry. Everyone has their go-to McDonald’s favourites, whether it’s for breakfast, lunch or dinner (or midnight snack). And everyone has their unique way they enjoy their treat. The best part? You eat your Maccas your way! Can’t stand pickles? You don’t have to have them on your Cheeseburger. Want your fries and a soft serve dipping? Why not? Is there anything more satisfying than devouring your ultimate McDonald’s comfort food from your favourite fast food joint? Who knows when that craving will hit? Sitting at your desk knee-deep in a uni essay (that’s late)? In the middle of a Netflix binge? Or maybe it’s dinner time and you just couldn't be bothered feeding the kids. We’ve all had those moments when we’re fighting breakfast pangs for lunch - rest assured Sausage and Egg McMuffins will abate those cravings. 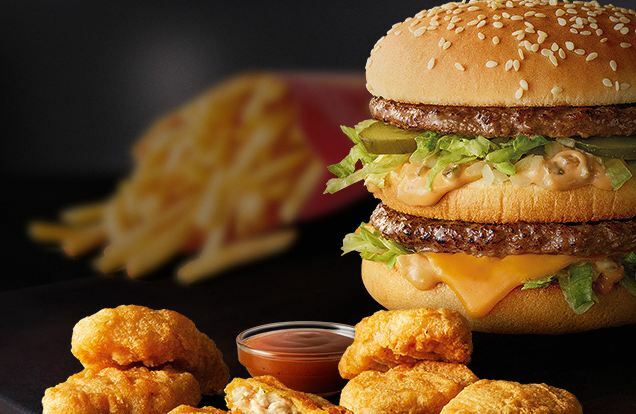 From feeding yourself or grabbing a Family box, Mcdonald’s is always a great takeaway idea for all those moments in life you just need to eat, fast!